It is CHALLENGE time people! Come November 1 I will be revisiting a challenge that I had been a part of back in Nov 2014 (check the post from past here). Yessss! 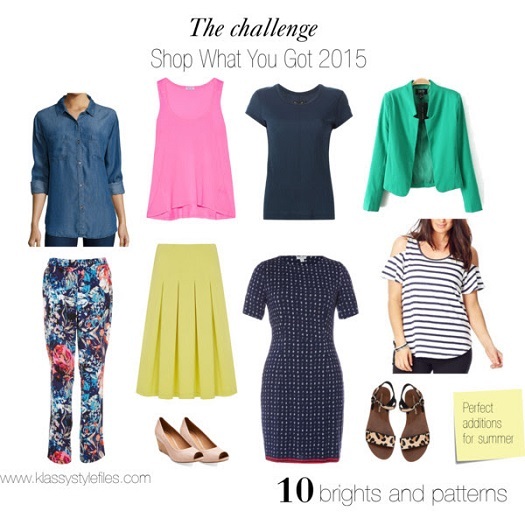 It is time for the Shop what you got 2015 challenge- a capsule wardrobe style challenge with amazing possibilities. 1. Create a capsule wardrobe of 30 pieces of clothing including tops. bottoms and outerwear AND shoes to wear over the next 30 days. The obvious challenge is pre-empting the kind of outfits that might be needed based on the general schedule, events and weather. A bit of research and awareness got me over this one. But I think mostly what has helped in narrowing down on this year’s capsule collection is my obsession with ‘capsule wardrobes’ in general and clarity around the BUILDING BLOCKS of what an ultimate summer capsule wardrobe might look like. Neutrals are golden pieces due to their versatility, of course but what would summer be without some lively colour! Fruity, intense and happy is how I describe the bold colour and patterns pieces I have chosen to compliment the neutrals in this capsule series. I will not be available to participate on the 7th and 15th due to professional and festive commitments but will play along on all other days. JOIN ME on Instagram and Facebook for daily style post to find out what pieces I am wearing and how. Also, stay tuned for weekly round ups here on the website. Loving your items! Thanks so much for playing along – I’ve linked your post to the linky in mine so people can follow your journey too!